Our Avondale floral arrangement is a beautiful mixture of seasonal fresh flowers, custom designed in a tall vase. 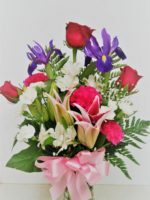 Flowers such as roses, lilies, iris and alstroemeria are custom designed with assorted greens for a contemporary look and style. 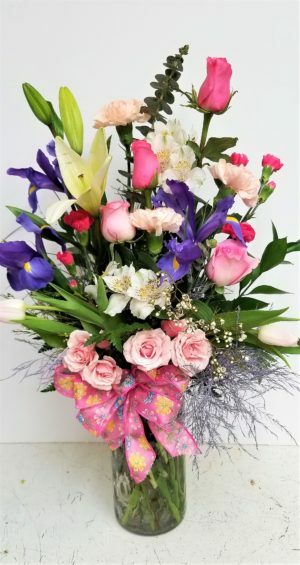 Perfect for the new mom, or a lady who loves the look and modern style of flowers, you’ll find our Avondale floral arrangement is great for Mother’s Day, Grandmother or your boss or secretary. 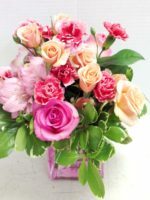 Great for a birthday or a get well wish, Avondale is the perfect floral arrangement for the lady in your life! 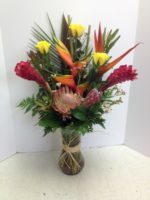 You might check out our Contemporary Sensation or Fashionably Contemporary arrangement.